I do have a proper toddy maker, but this seems like less fuss? And it makes awesome coffee, I love it inordinately. Or I should say it makes "super flavor" coffee with lots of aromatics and not so much oils and acids, the sweetie man can actually taste this and thinks it tastes weird with too much for the former and not enough of the latter. So here's another thing to be balanced or unbalanced about. Put coffee in a quart mason jar, fill jar with cold water and stir. Let stand uncovered for 3-4 hours. 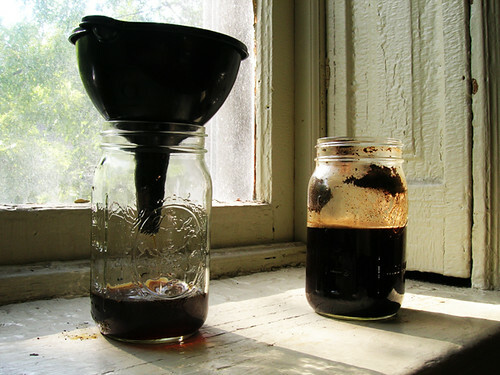 Set a funnel lined with a coffee filter over another mason jar. You probably want to spoon the top chunk of grounds into the filter, so it doesn't go PLOP and make a mess when you try to pour it into the funnel. Pour the rest of the coffee into the funnel, pausing to let it drain as necessary. Put the lid on the jar and keep the filtered coffee in the refrigerator. When you want iced coffee, pour one part coffee and one part water into a glass.